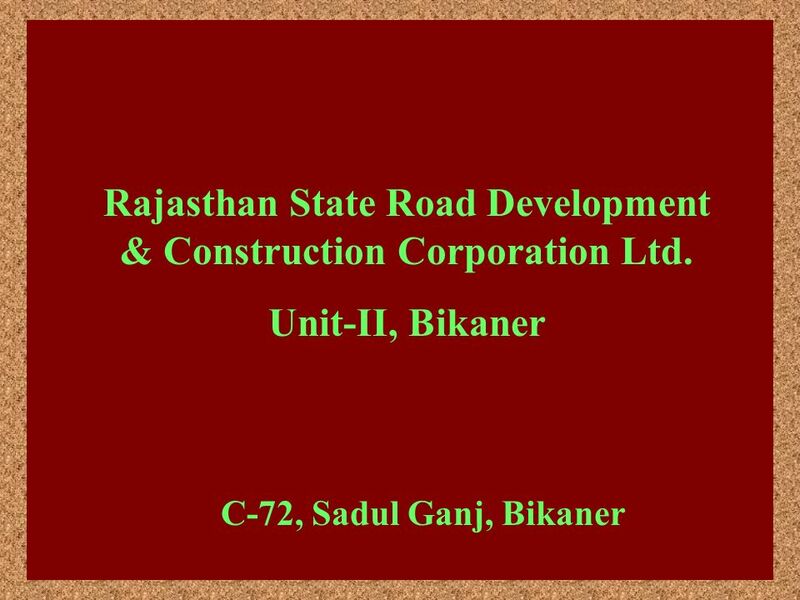 1 Rajasthan State Road Development & Construction Corporation Ltd.
Department Mode Actual/Tender Estimated Cost Remarks 1. 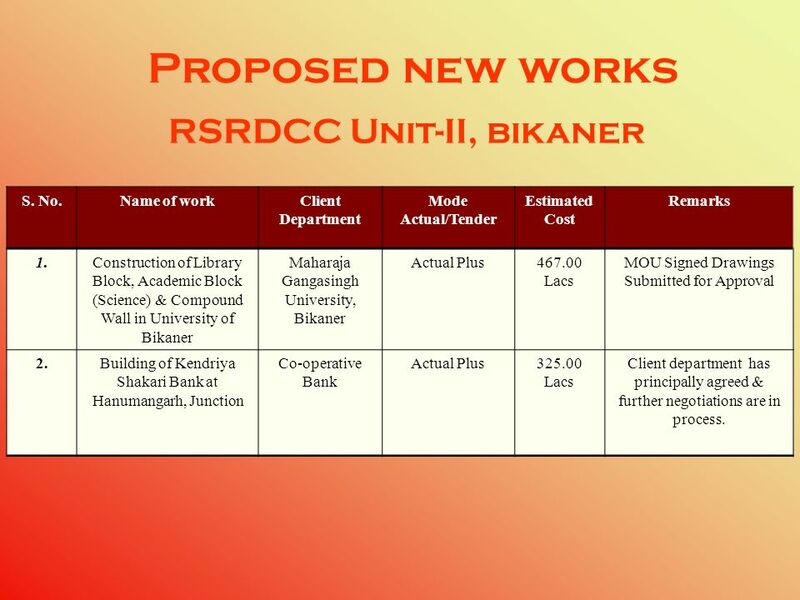 Construction of Library Block, Academic Block (Science) & Compound Wall in University of Bikaner Maharaja Gangasingh University, Actual Plus 467.00 Lacs MOU Signed Drawings Submitted for Approval 2. Building of Kendriya Shakari Bank at Hanumangarh, Junction Co-operative Bank 325.00 Client department has principally agreed & further negotiations are in process. 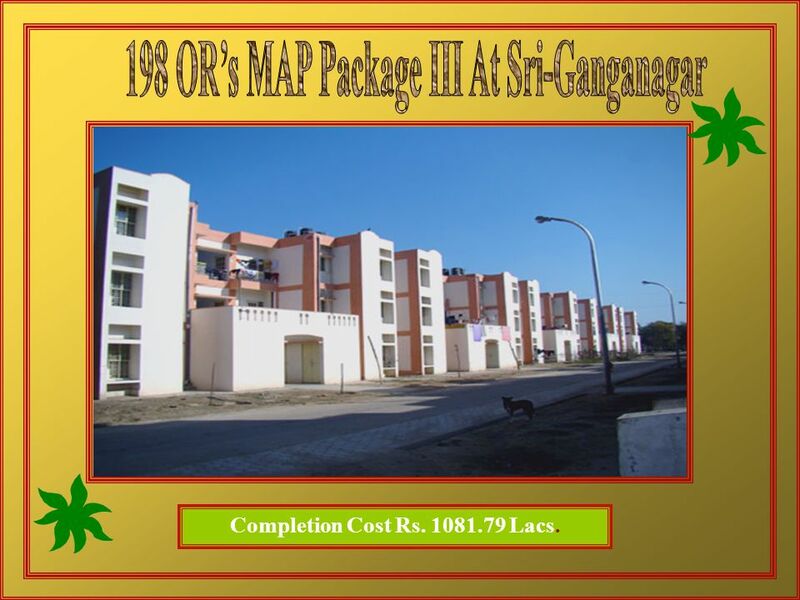 1 Construction of Married accommodation Project For OR’s & JCO’s at Sriganganagar & Suratgarh. 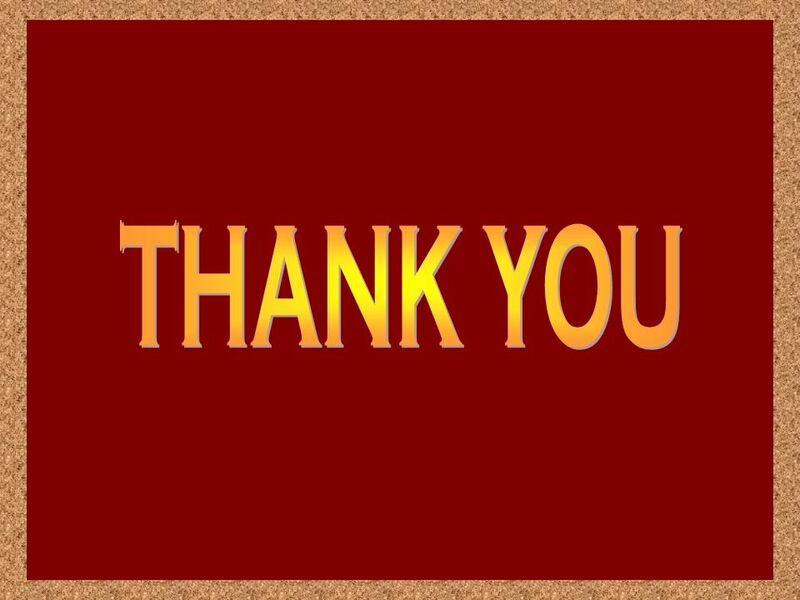 [Tendered work.] 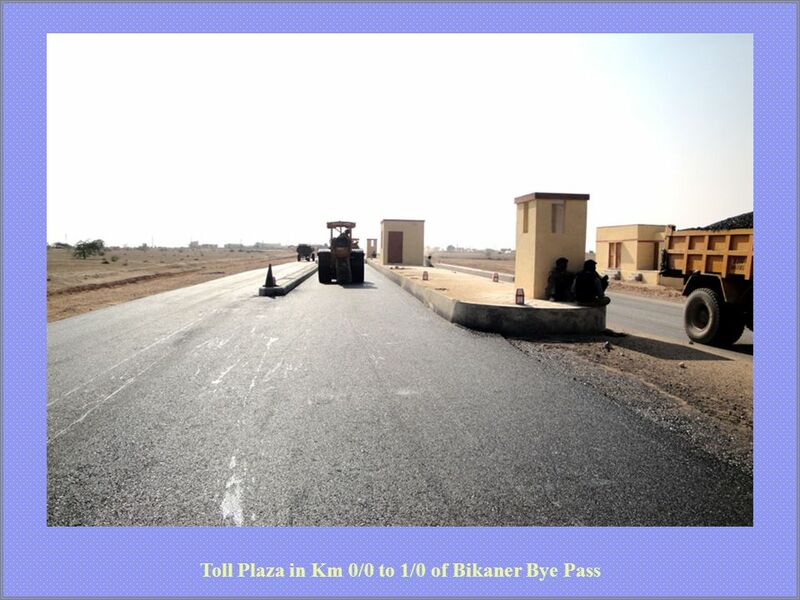 Completion Cost Rs Lacs. 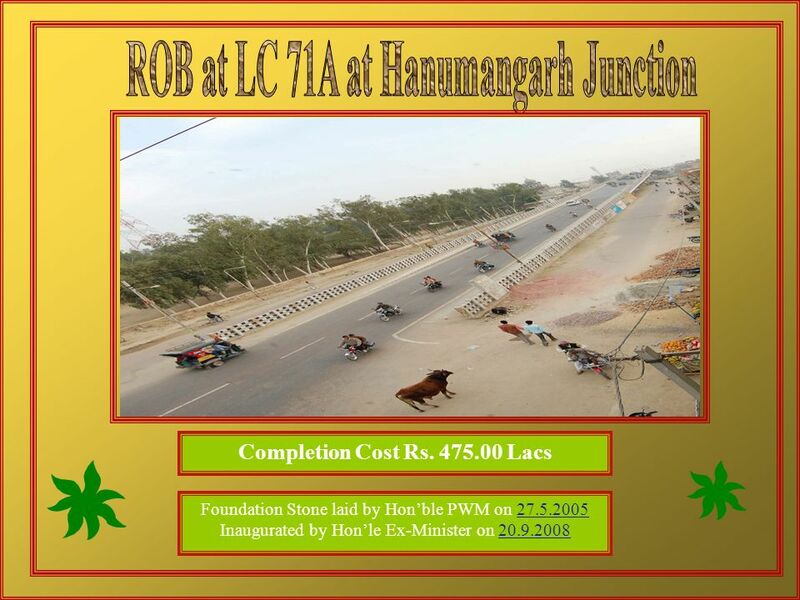 2 Stregthening & improvement of Hanumangarh Pillibanga Suratgarh road including ROB at LC 71 A at Hanumangarh Junction. 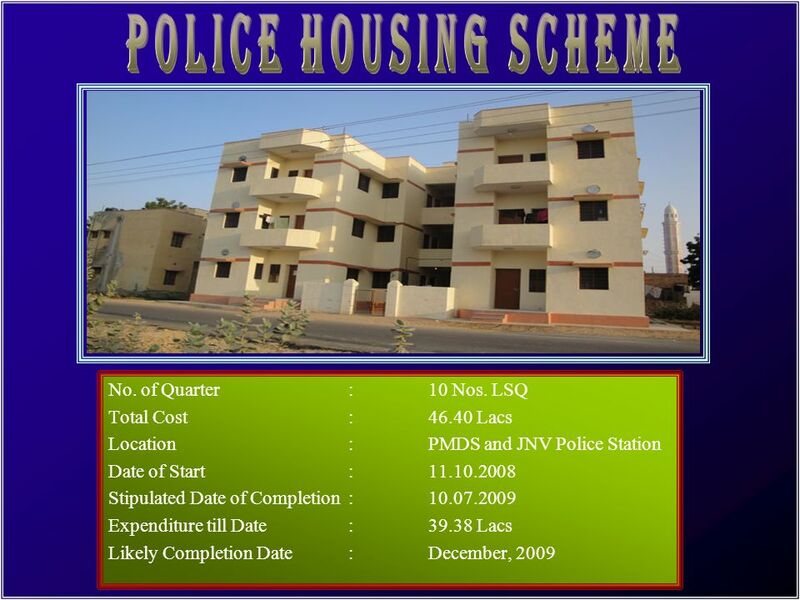 Completion Cost Rs Lacs. 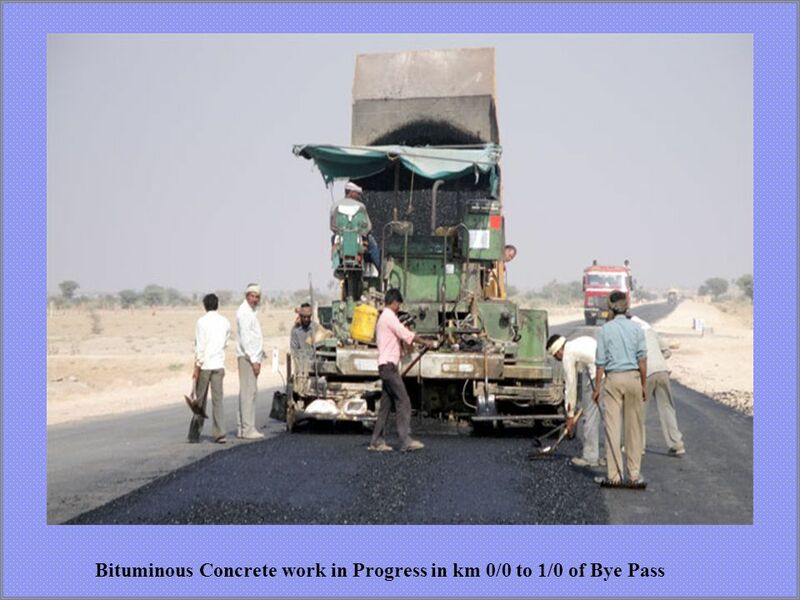 3 Construction of V.C. 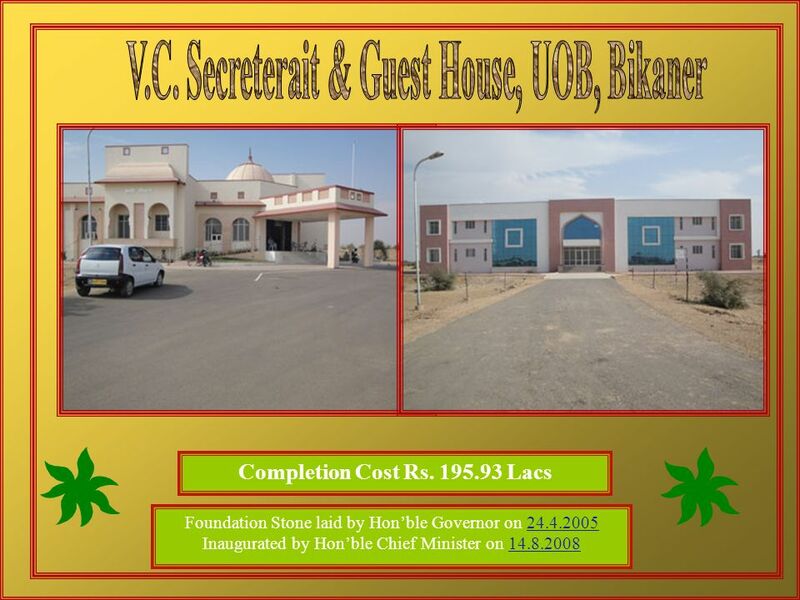 Secretariat, Examination Block, Administrative Block and Guest Housing Buildings in University of Bikaner. 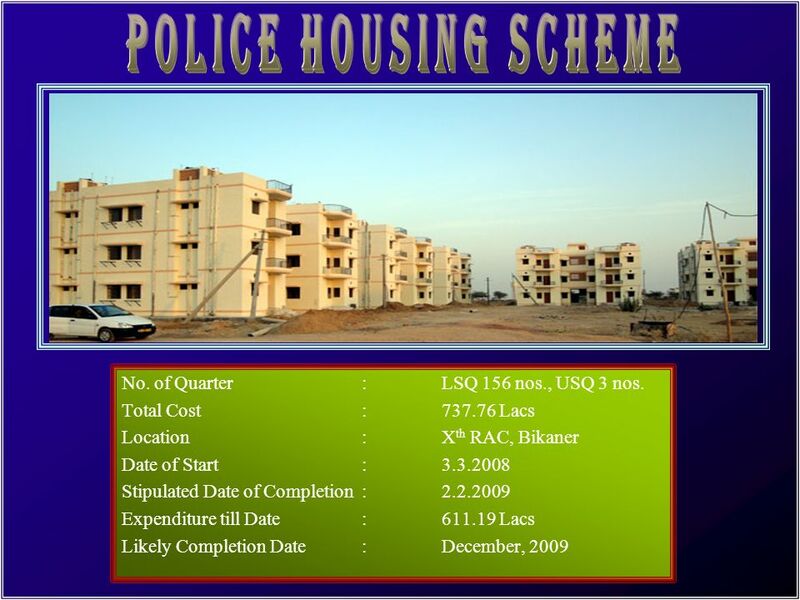 Completion Cost Rs Lacs. 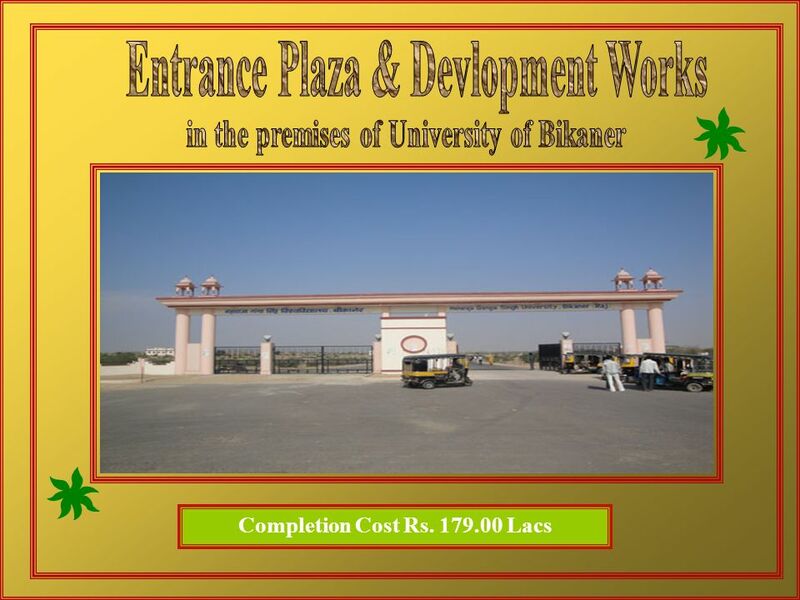 4 Construction of Internal road, Entrance Plaza, Compound Wall, Water Supply arrangements and External Electrification Work in the premises of University of Bikaner. 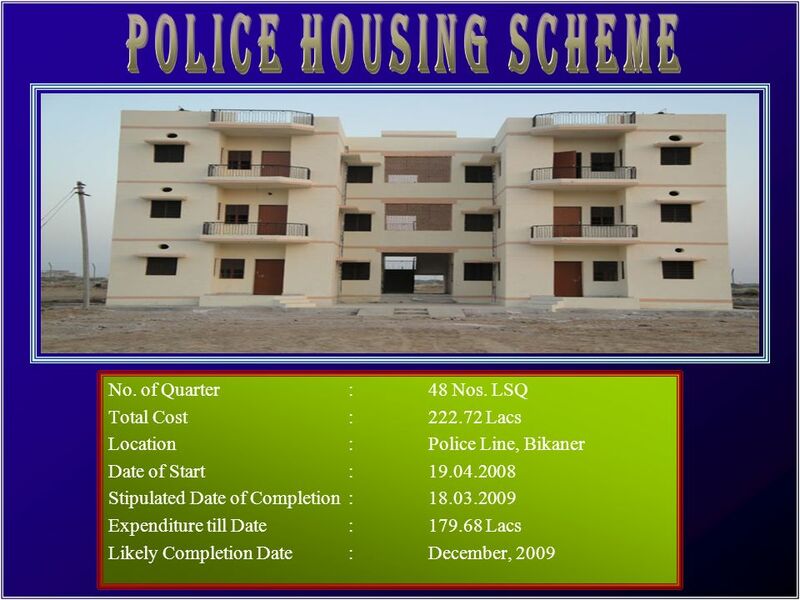 Completion Cost Rs Lacs. 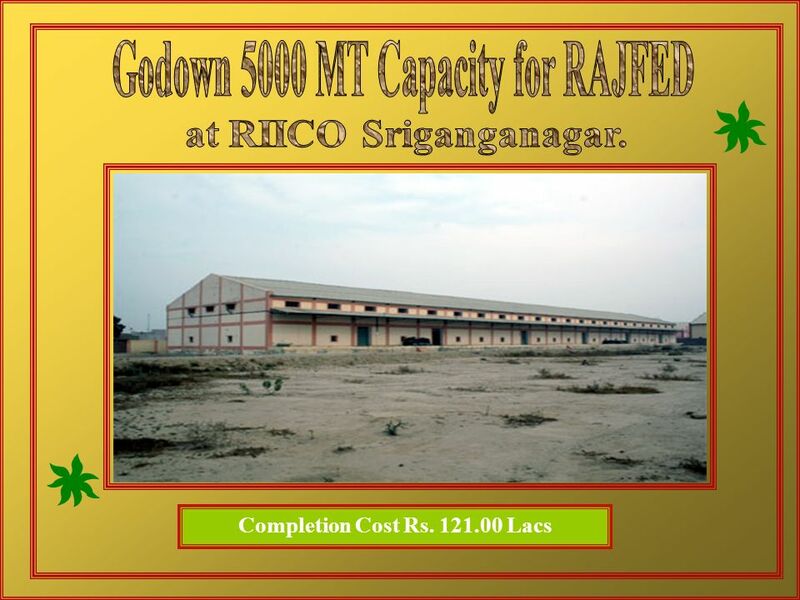 5 Construction of 5000 MT Godown, Office building, Compound Wall, Internal road for RAJFED at Sriganganagar. 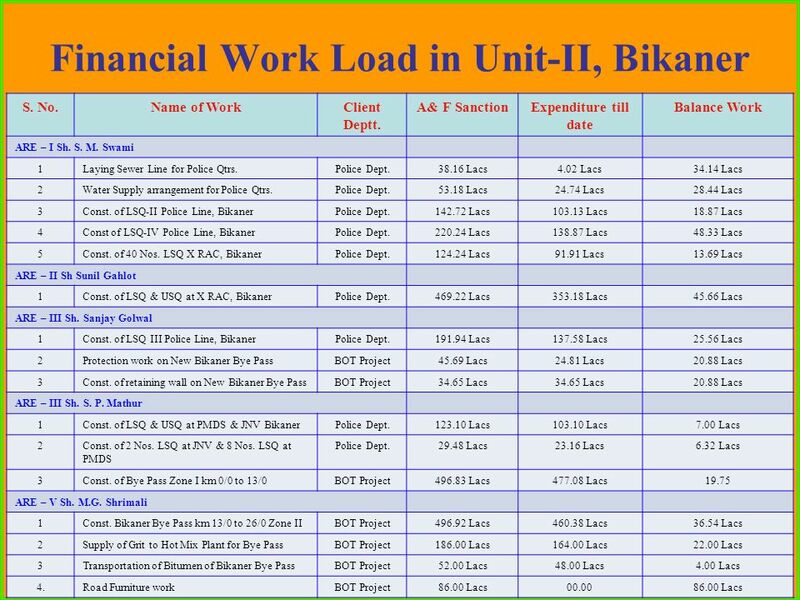 Completion Cost Rs Lacs. 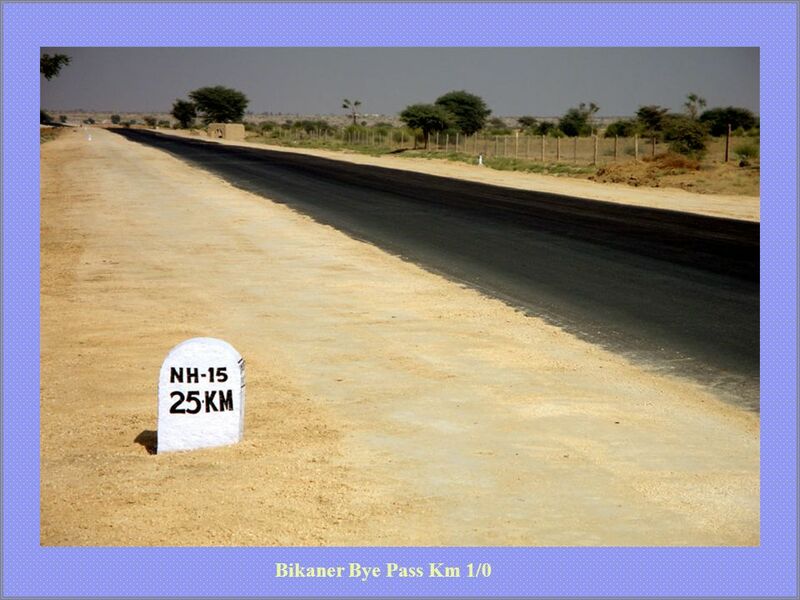 6 Widening and Strengthening of Sriganganagar Hanumangarh road km 0/500 to 56/0 [BOT Project ] Tendered Work. 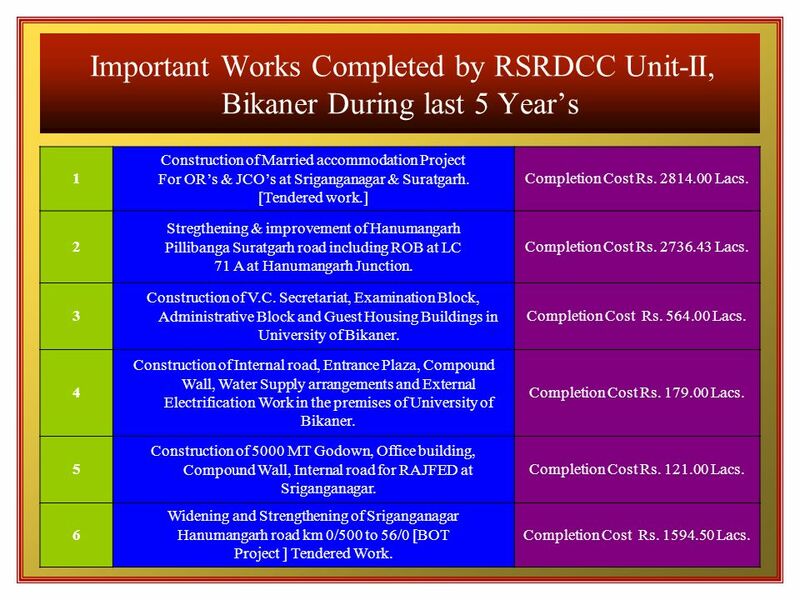 Completion Cost Rs Lacs. 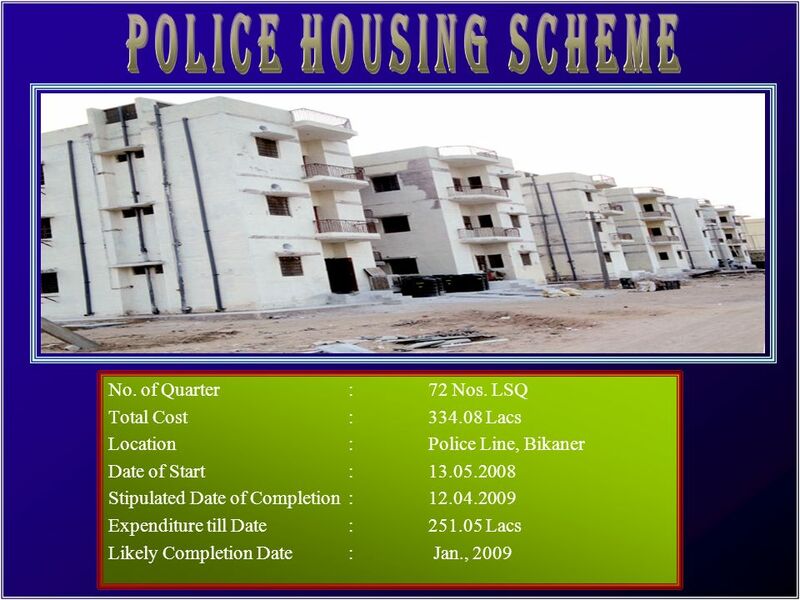 11 POLICE HOUSING SCHEME No. of Quarter : LSQ 156 nos., USQ 3 nos. 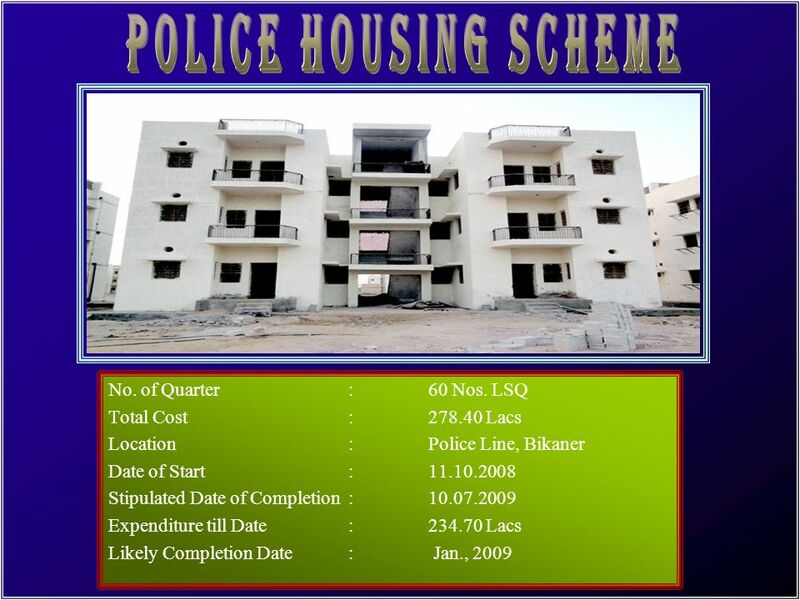 18 POLICE HOUSING SCHEME No. 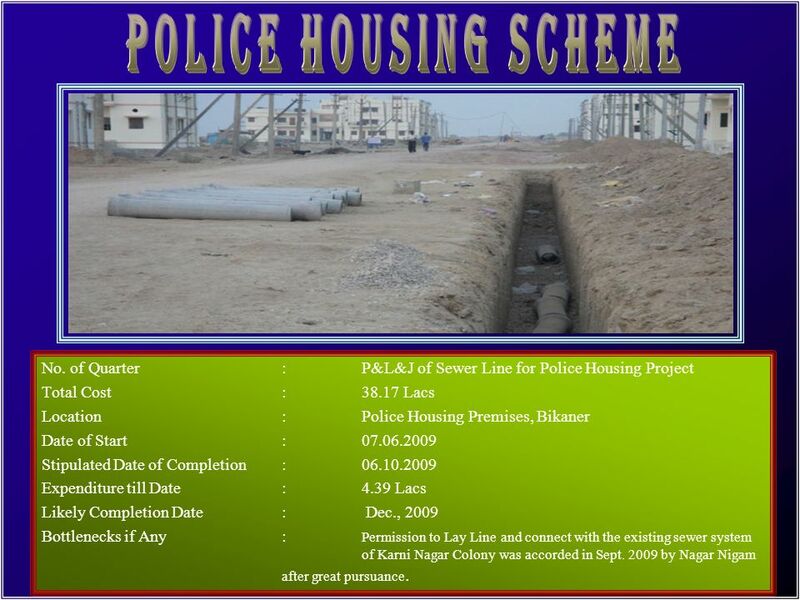 of Quarter	:	P&L&J of Sewer Line for Police Housing Project Total Cost	: Lacs Location	:	Police Housing Premises, Bikaner Date of Start	: Stipulated Date of Completion	: Expenditure till Date	:	4.39 Lacs Likely Completion Date	:	Dec., 2009 Bottlenecks if Any	:	Permission to Lay Line and connect with the existing sewer system of Karni Nagar Colony was accorded in Sept by Nagar Nigam after great pursuance. 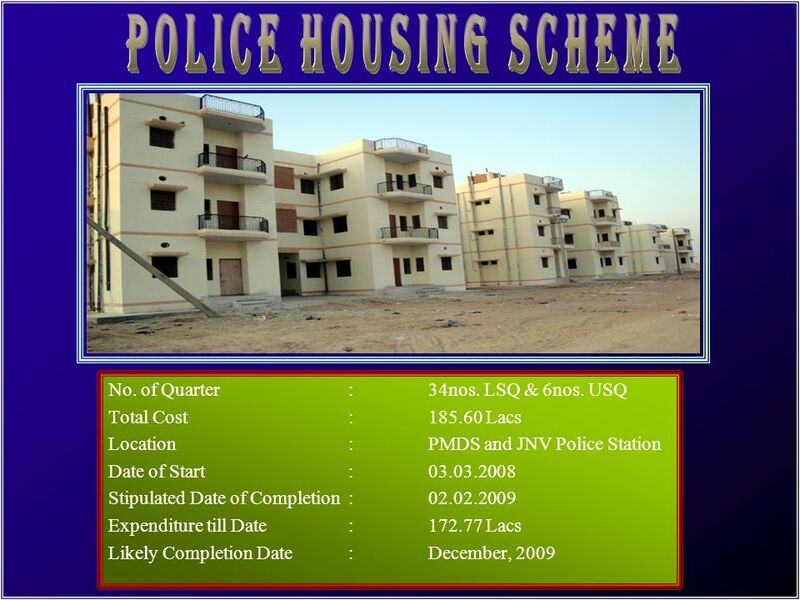 19 POLICE HOUSING SCHEME No. 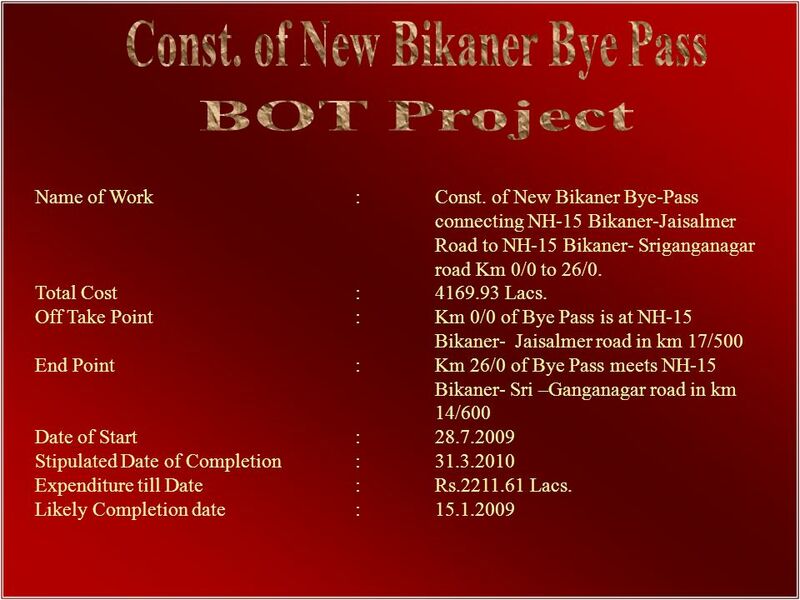 of Quarter	:	Const. 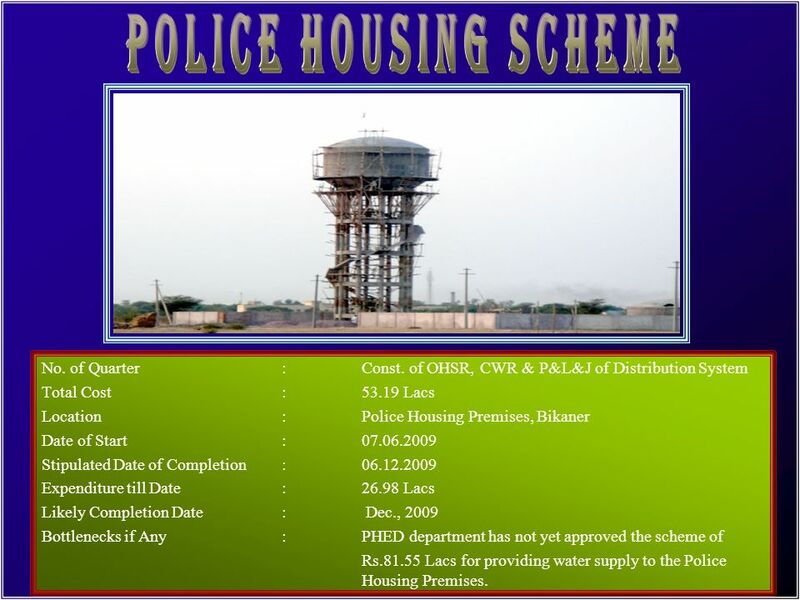 of OHSR, CWR & P&L&J of Distribution System Total Cost	: Lacs Location	:	Police Housing Premises, Bikaner Date of Start	: Stipulated Date of Completion	: Expenditure till Date	: Lacs Likely Completion Date	:	Dec., 2009 Bottlenecks if Any	:	PHED department has not yet approved the scheme of Rs Lacs for providing water supply to the Police Housing Premises. 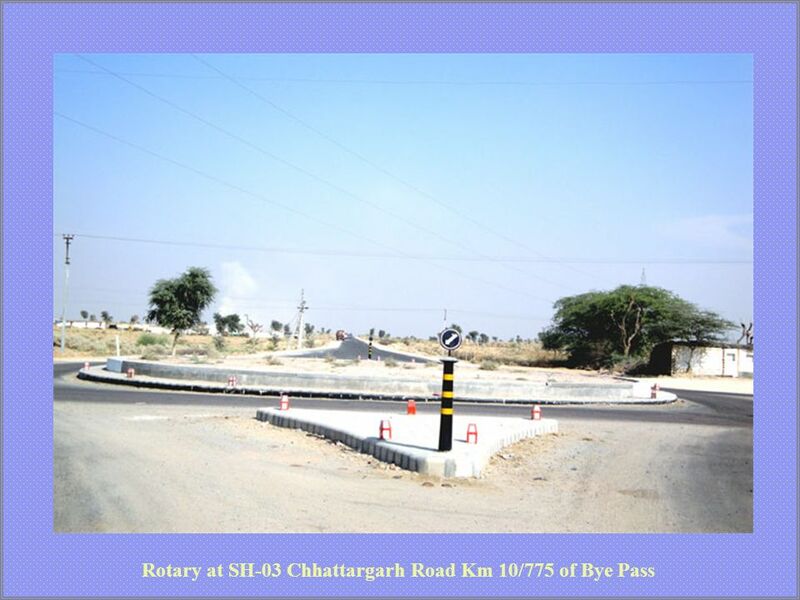 Download ppt "Rajasthan State Road Development & Construction Corporation Ltd."
RSRDC UNIT-IV, JAIPUR. 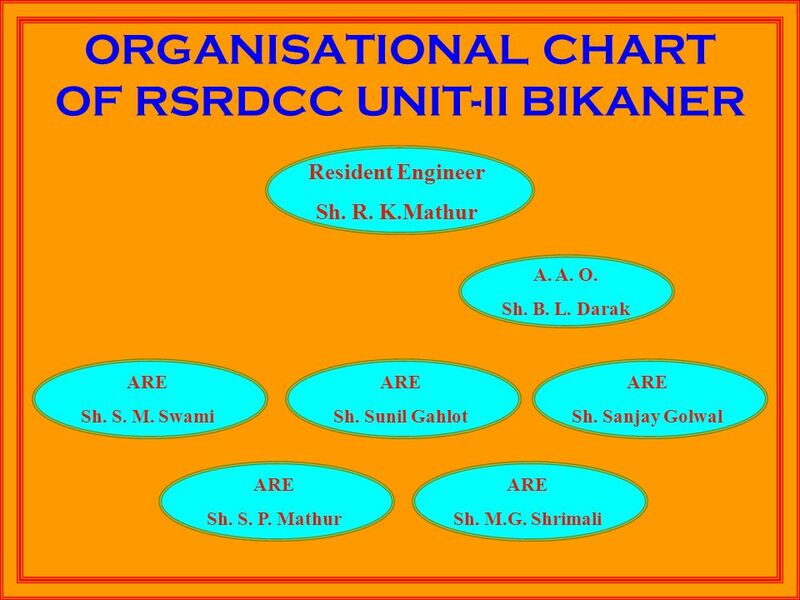 ORGANISATION CHART OF RSRDC UNIT –IV, JAIPUR R.E. Sh.S.S. Vijay ARE Sh. R.K. Vijay ARE Sh.M.K. Saini ARE Sh. 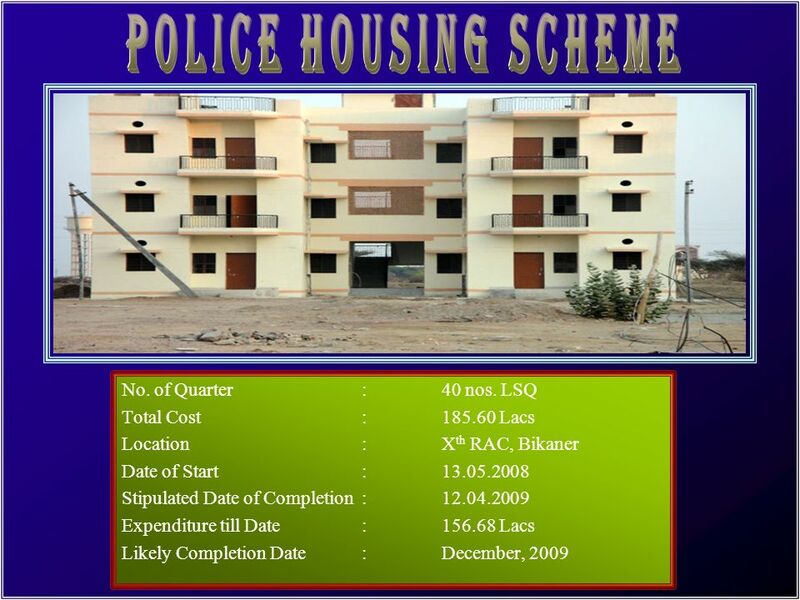 Rajiv Sethi ARE Sh.